Gerry Adams has begun a legal bid to overturn two historical convictions he received for attempting to escape from prison in 1975. The Sinn Féin president has started proceedings in Belfast over incidents that happened when he was interned without trial in in the Long Kesh detention camp. He was among hundreds held without trial during the Troubles. The NI Courts Service said the appeal is listed for hearing on 16 October. The Maze prison was built on the site of Long Kesh. Speaking to the Press Association, Mr Adams said he had instructed his solicitor to begin the process of appealing the convictions "following the recovery of a document from the National Archives in London". It was discovered by the Pat Finucane Centre in October 2009. 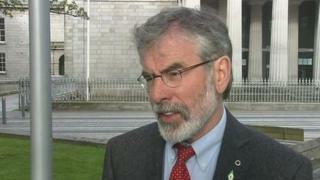 Sinn Féin has confirmed that Mr Adams has started the appeal, but a party spokesperson said it did not wish to comment further. Internment without trial for those suspected of being involved in violence was introduced in 1971 by Prime Minister Brian Faulkner. Mr Adams was interned in March 1972, but was released in June that year to take part in secret talks in London. He was rearrested in July 1973 at a house in Belfast, and interned at the Maze Prison, also known as Long Kesh internment camp. On Christmas Eve 1973, he was one of three prisoners apprehended by wardens, while trying to cut their way through the perimeter fencing. In July 1974, he again attempted to escape by switching with a visitor at the Maze. He was subsequently sentenced to 18 months in jail for attempting to escape.